Velcro for attaching the ESC, Rx and battery. 1. Select the two longest pieces of flat carbon fiber (500mm) and glue them along the flat edge of both Wing 1 pieces. 3. Select the two remaining pieces of flat carbon fiber (480mm and 265mm) and glue them to the matching edges of the Wing 3 piece (the piece with the prop slot). 4. Find the Wing 4 pieces and cut a bevel in the rear surface. Be sure to make a left and a right side. 5. Find the two elevon pieces and cut a bevel into the hinge edge of them, making a left and right side. The hinge/bevel side is the one that the control horn slot is closest to. 6. 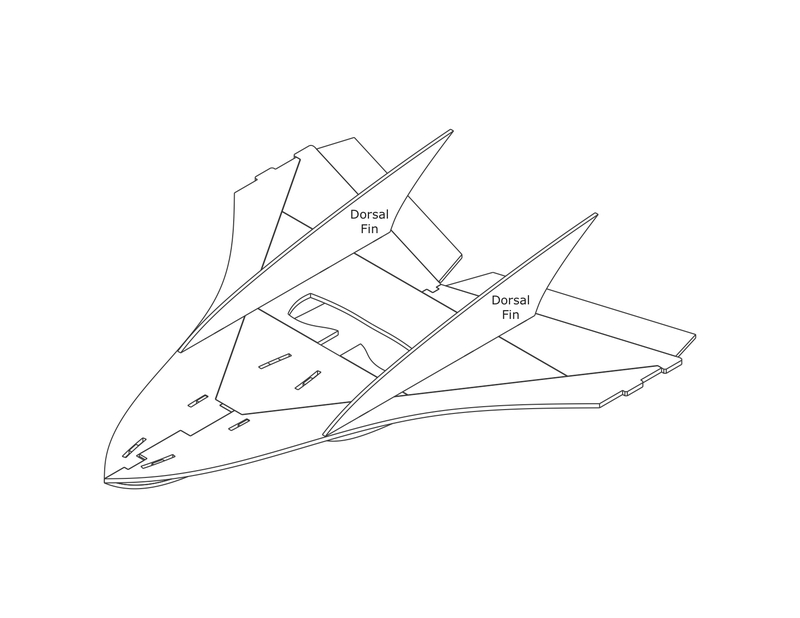 Using Foam-Tac, hinge the elevons to the Wing 4 pieces. 7. Glue the Wing 4 pieces together. 8. 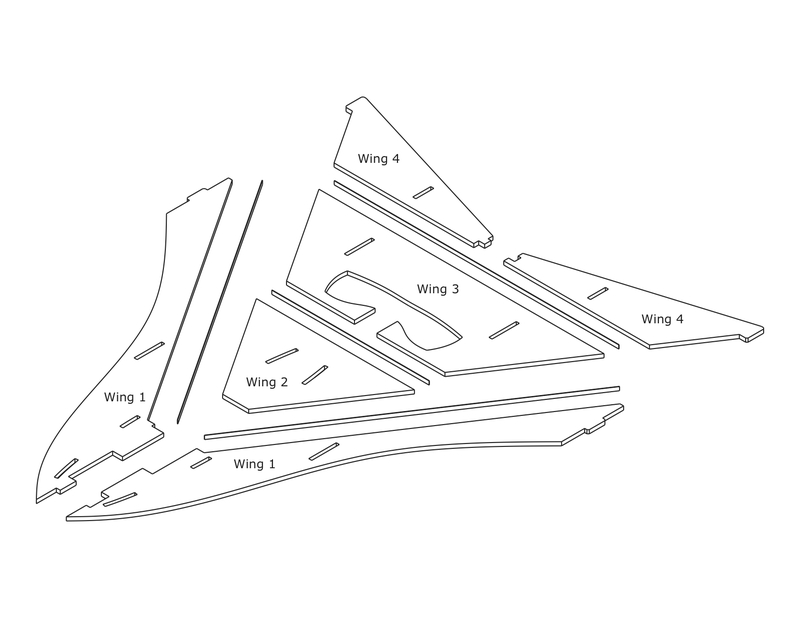 Assemble the horizontal wing by gluing the Wing 2, 3, and 4 assemblies into the V formed by the Wing 1 sections. 9. With the bevel for the elevon hinge facing up, install the 2 larger fins in the outer slots in the horizontal wing assembly. 10. 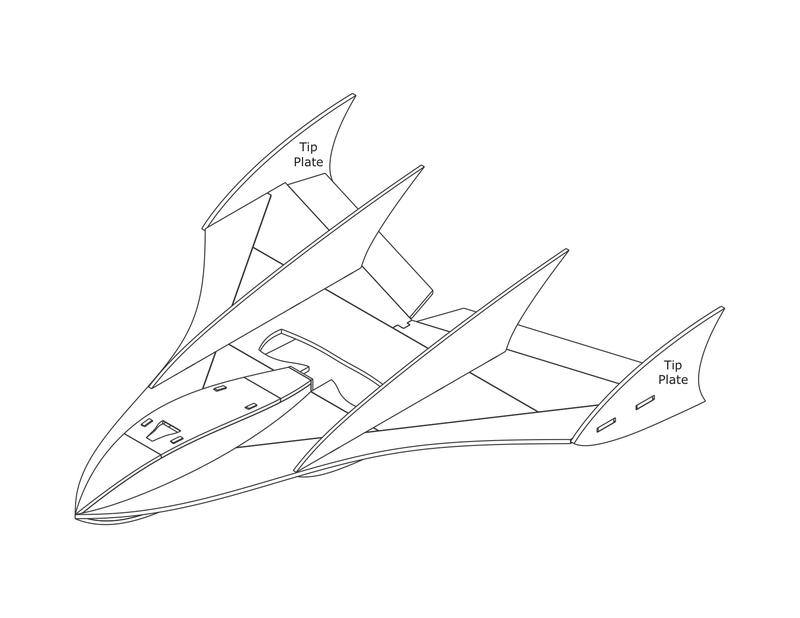 Insert the larger of the formers (F3) into the front slot on the wing surface. 11. Glue the larger set of fuselage sides onto the top of the horizontal wing assembly. Slide them back so the rear of the sides is even with the carbon fiber in the prop slot and squeeze them together so the outer edges match the cutout edges. Make sure the front points of the sides glue next to each other. 12. Build the hatch with the two Hatch 2 sides making note that they extend beyond the front of the Hatch 1 (the front being determined by the air vent). Fill the space between the front of the Hatch 2 sides with the Hatch 3 piece. 13. 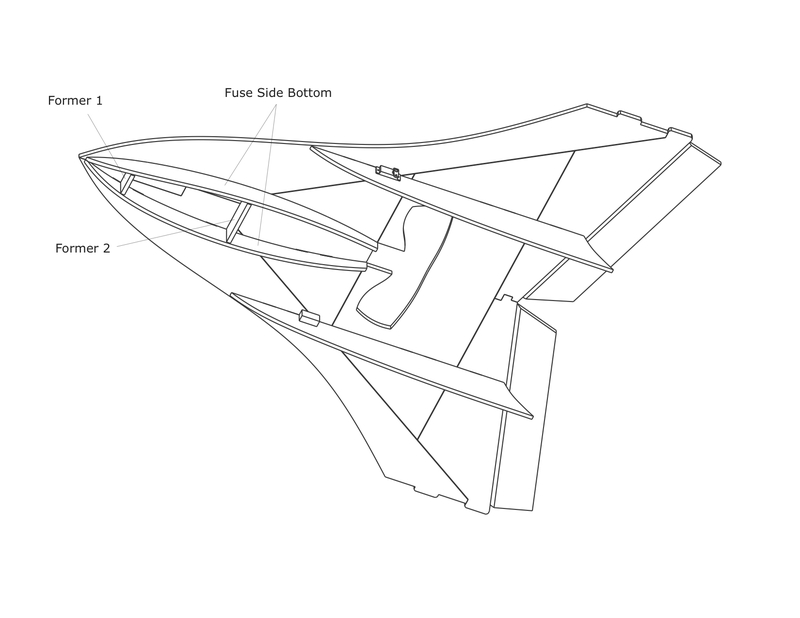 Glue the Fuselage Tail piece to the back of the fuselage so the rear is even with the back of the carbon fiber spar. Do not install the Hatch Magnet piece at this time. 14. 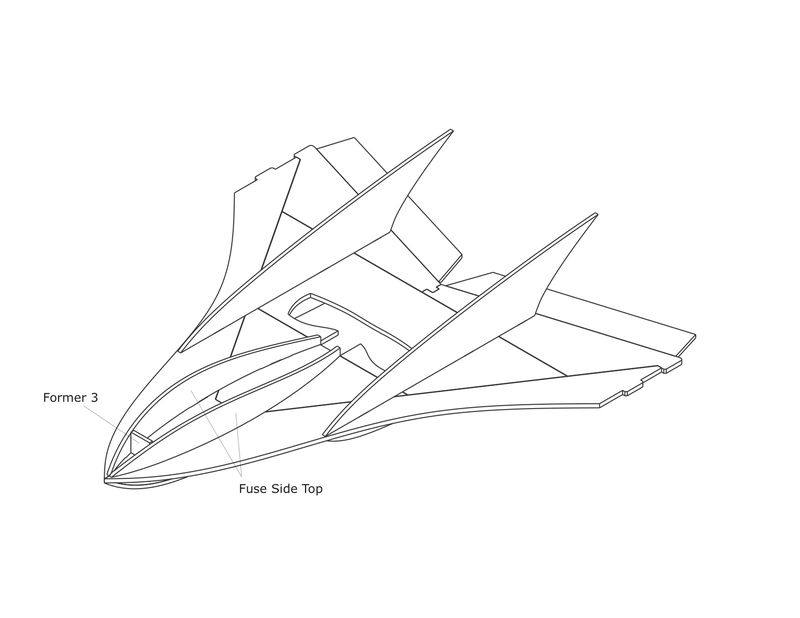 Place the assembled hatch into the fuselage so the rear of it is against the Fuselage Tail position. 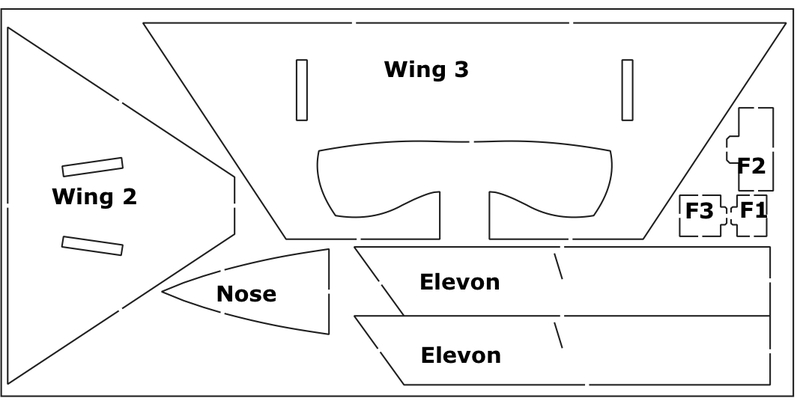 Mark the position of the front edge of Hatch 1 on the top of the Fuselage Sides. Remove the hatch assembly. 15. Glue the triangular Nose to the front of the fuselage with the rear aligned with these marks. 16. Glue the Hatch Magnet piece in place at this time. 17. Turn the plane over to work on the bottom of the plane. 18. 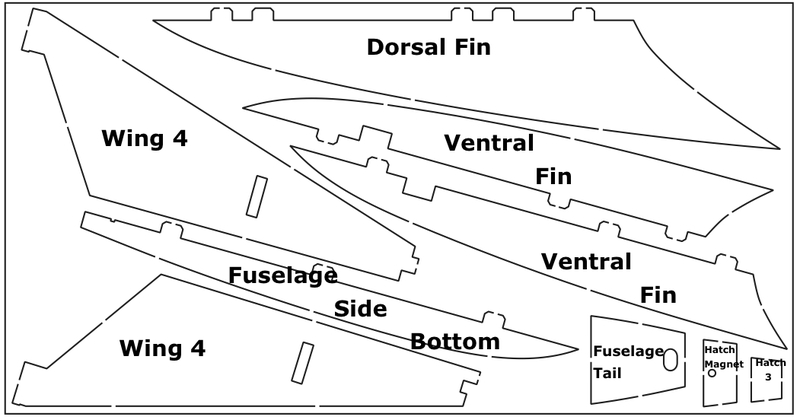 Locate and install the two Ventral Fins. 19. Install the two servos into the cutouts in the Ventral Fins so the servo arms are mounted on the outboard sides. 20. Insert the servo wires through the fuselage slots into the top compartment. 21. Glue Former 1 and Former 2 into the appropriate slots. 22. Glue the Fuselage Side Bottoms into the slots and to the formers. Align the rear of the sides with the back of the carbon fiber spar and the outer edges with the edge of the motor opening. Glue the front of them side by side as well. 23. 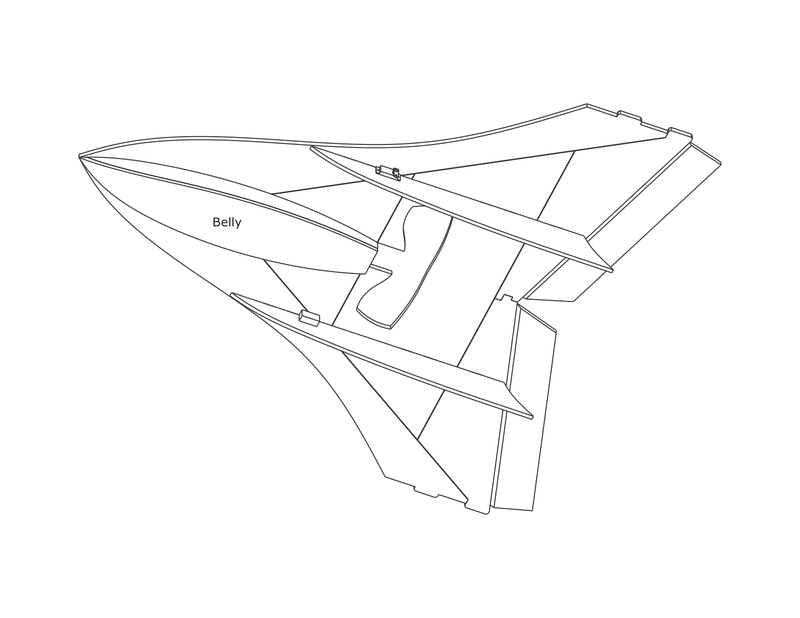 Glue the Belly onto the fuselage sides and be sure to keep the rear of it aligned with the rear of the carbon fiber spar. 24. 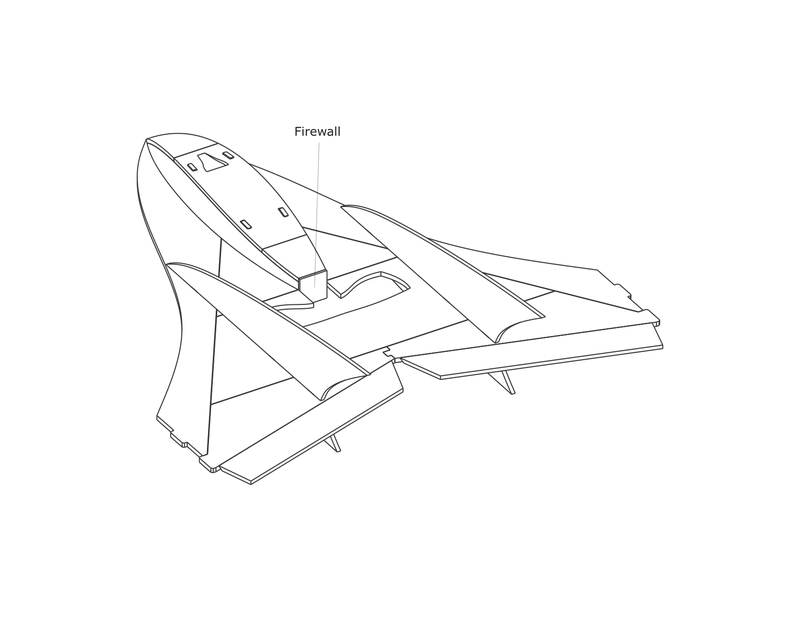 Glue the firewall onto the rear of the fuselage. You may find it easier to attach the motor mount to the firewall before installing it. 25. Glue the elevon horns into the slots so the forward edge of the horn is even with the hinge line. 26. Glue the Tiplets in place on the ends of the wing. 27. Using the round carbon fiber rods and Z-bend pushrod wires, create and install the servo pushrods. 28. Install the hatch magnets in the hole in the fuselage piece as well as the underside of the rear of the hatch. 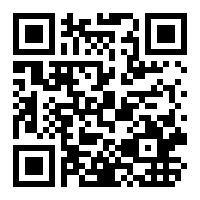 Be sure to install them so the hatch is attracted and not repelled when installed. 29. Install the motor into the mount on the firewall so the wires are pointed up. 30. 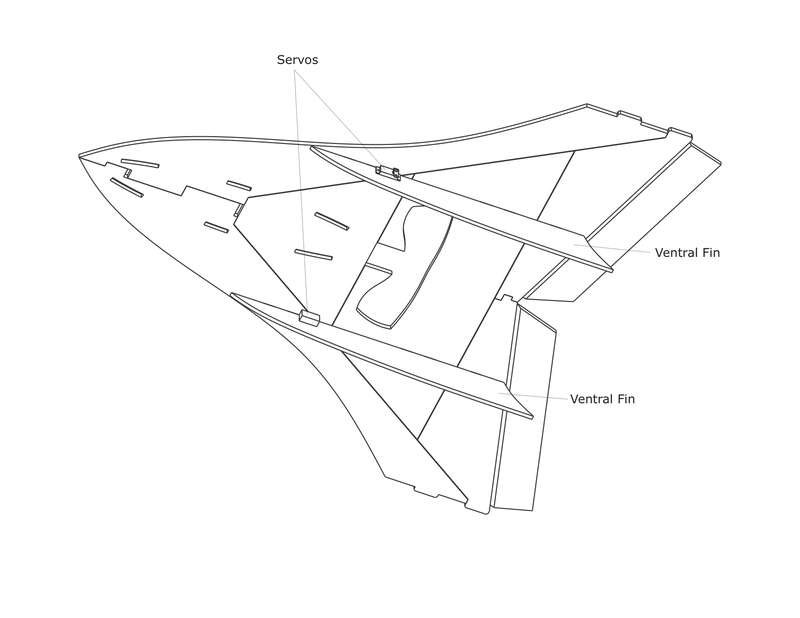 With the ESC in the fuselage, pull the motor connections through the rear hole in the Fuselage Tail piece and connect the motor to them. 31. Install the receiver into the plane and connect the servos and ESC connections to it. 32. Install a prop on the motor (so the prop is facing the front of the plane) with the prop saver supplied with the completer kit. 33. Making sure all wires are clear of the prop (but don’t push the ESC wires into the fuselage yet), test the motor direction to make sure the propeller is pushing air towards the back. If not, swap any two motor/ESC connectors. Once this is done you can push the ESC wires into the fuselage. 34. 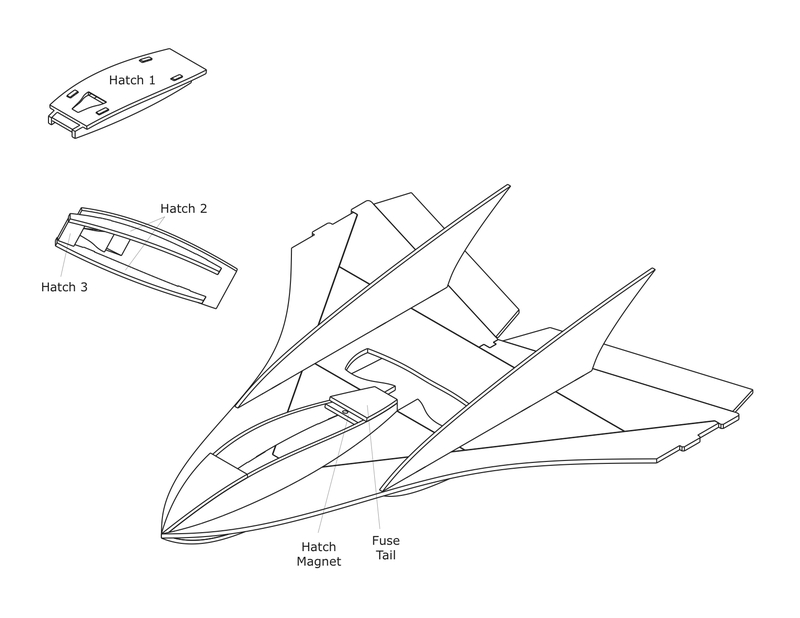 The CG (center of gravity) should be set to the location of the hatch magnet initially. 36. 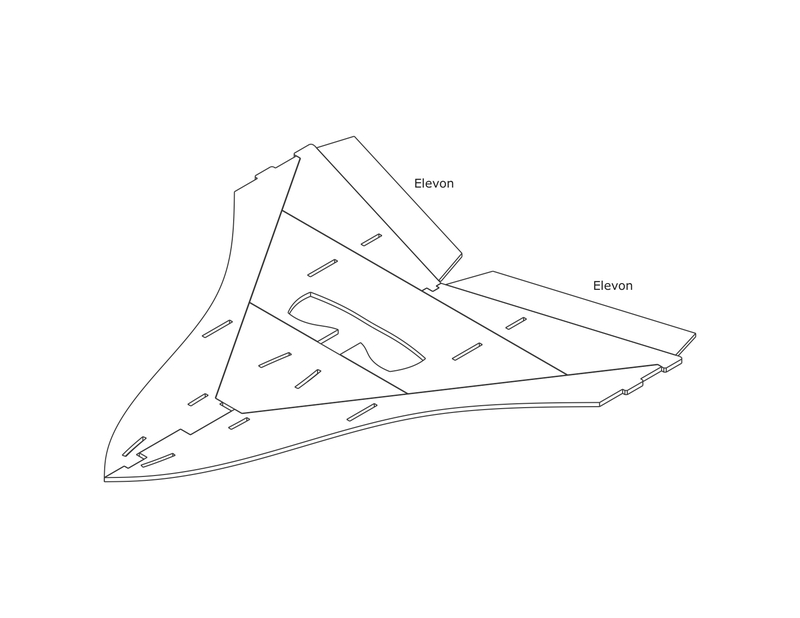 When test flying the EPP BluFO for the first time it is suggested that you hold your transmitter in your right hand and hold the plane with your left hand from the back between the elevons, away from the prop. Point the nose of the plane up at about a 45 degree angle and advance the throttle to about half and give it a push upward. 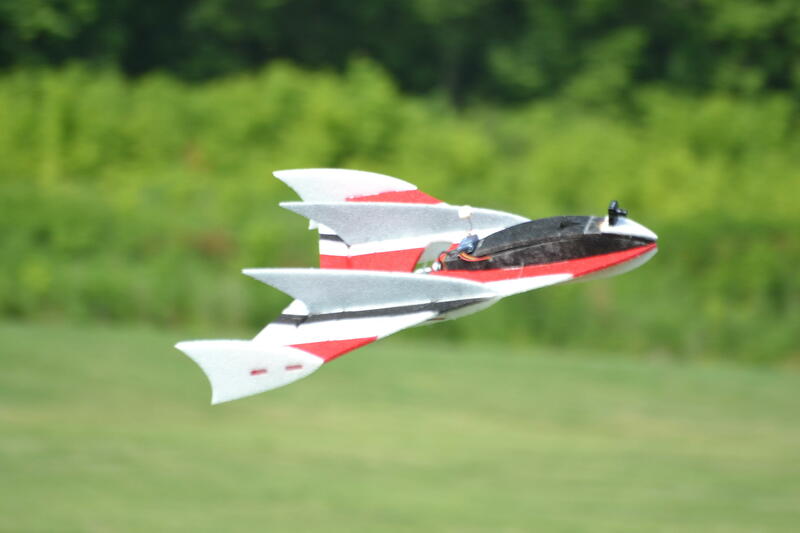 The plane should fly upward and give you enough time to correct any trim adjustments.